Here are the Cubs $lots for the upcoming MLB Draft on June 4-6. They will have FOUR picks on the first day of the draft! That will be quite the haul of talent in one day. While I technically have not done a post about college bats, I have talked about several of them over the course of the past three months. Everyone is quite aware of my affinity for Alec Bohm of Wichita State, who hit two homeruns on Thursday. His teammate, Greyson Jenista, and Luken Baker of TCU both have powerful bats but there are concerns about where to play them defensively. In addition, a few college bats are beginning to creep up and into the first round. 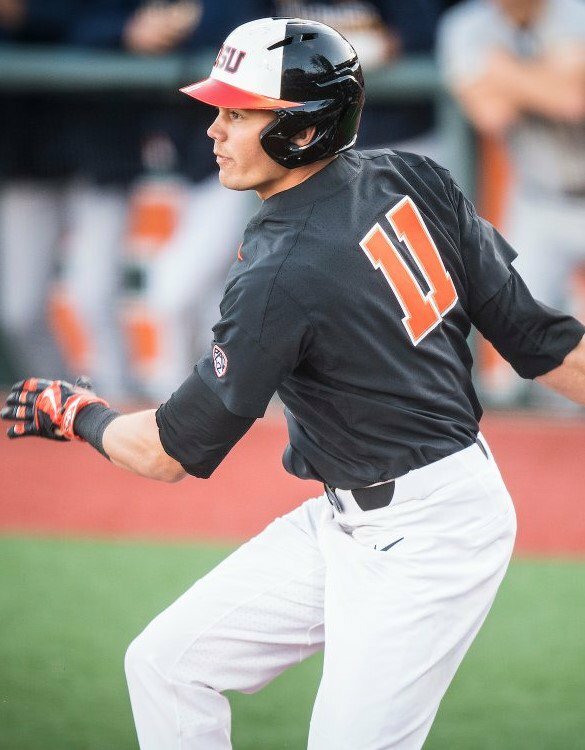 Seth Beer of Clemson, Brett Kinneman of North Carolina State, and Trevor Lanarch from Oregon State all have interesting profiles that I felt I needed to dig a little deeper to get some more information. A year ago, Seth Beer of Clemson was seen as the unanimous number one pick in most mock drafts. A poor 2017 spent playing for USA baseball, caused his drop out of the first round. He’s likely been pitched around quite a bit it and has not really had a lot of good looks or chances to hit something. That is beginning to change. He seems to be making a comeback thanks, in part, to a reword pre-hitting routine. Beer has 3 jacks just this week. Let’s keep an eye on this. What I like most about Kinneman is that he improves every year in stages, very distinct stages. Whether it is in college or the Cape Cod league, he has grown into someone who is now one of the NCAA leaders in home runs with 12 heading into this weekend. There’s a lot to like here, especially what he’s done in the Cape Cod league from year-to-year. He’s shown the ability to increase his average from .273 to .300 and his on base percentage increased dramatically as he began to cut down on strikeouts. He has almost equaled or surpassed most of hitting stats, including HRs and RBI, from 2017 already this year with 2 months to go. Surprisingly, Kinneman generates all that power from a 6’0″ and 188 pound frame. Finally, Trevor Lanarch of Oregon State is putting together an impressive season. Aside from his performance, he has the frame and the type of profile the Cubs tend to love at 6’4” and 210 pounds. He’s an ascending player who is not done filling out. He bets left and throws left and his power has increased all the while playing for one of the top programs in Division I baseball the past two seasons. Two months may not seem that far away when it comes to the draft. There’s a lot of baseball left to be played. While Alex Bohm is still my number one guy, I could be talked into Lanarch. Beer might still be a harder sale. I still need more data and more eyes on Seth and Kinneman who is not very big, but hits that way. The next draft prep will look at some ascending college pitchers along with Rayne Supple of Wake Forest, who the Cubs picked three years ago out of high school in Vermont.